The Shigatse prefecture is the gateway for climbers to the North Col climbing route of the world's highest mountain, Mount Everest. The ultimate climber's challenge, Mount Everest towers at 29,028 feet (8,848m) on the border between Tibet and Nepal. 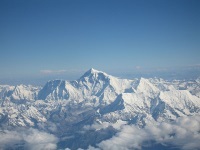 The Tibetan name for the peak is Mount Quomolangma, which means 'the third goddess'. Access to the Everest Base Camp is via the town of Tinggri. About 20 miles (30km) from the town hiking tracks take climbers on a 48-mile (78km) trek to the first camp. About six miles (10km) from the base camp is the highest monastery on earth, Rongbuk Monastery, at an altitude of 16,728ft (5,099m). The monastery is being restored and offers hostel accommodation. Just south of the monastery is the world-renowned Rongbuk Glacier. Because of its height, adventurers wishing to climb Mount Everest will need to allow several weeks simply to acclimatise to the thin atmosphere. Climbing Mount Everest is not to be entertained without the aid of a guide, and should only be attempted by extremely experienced climbers. Many have died attempting to reach the summit - about 280 people are thought to have perished on the mountain and fatalities occur almost every year. However, it is an awe-inspiring area to explore even for travellers not intending to climb the peak. Numerous travel agencies offer package multi-day hikes around the area and up to the Everest base camp.